Last year, I ate a lot of nuts. And since I wasn't buying them in bulk, I made myself keep the packaging. As evidence of my nut habit. But also as a reminder to myself to stop buying pre-packaged nuts! I knew I'd find a way to use the containers (did you see my nutty lamp?) but I had no idea what I'd do with the lids... until Ms Ro asked for a mobile. And then the wheels started turning! I remembered seeing a beautiful bird mobile on The Red Thread that included fabric-wrapped "swings" for the birds. 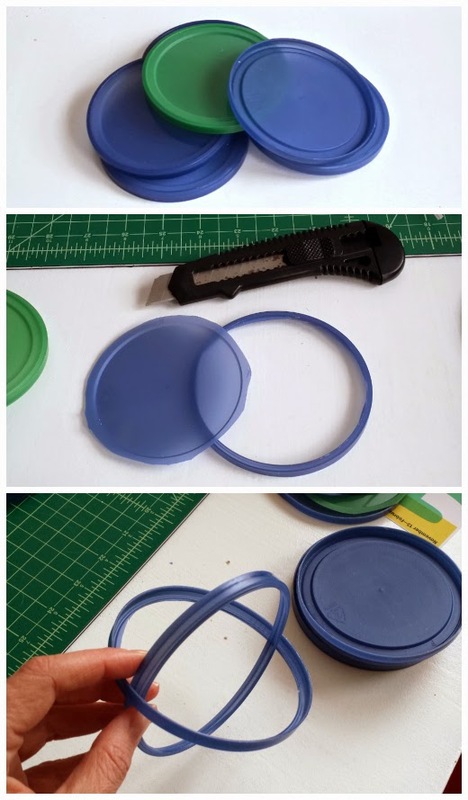 Taking that as my inspiration, I cut the centers out of the lids to create rings. Ro went through my fabric stash and chose the ones she liked. Then the wrapping began. Cut the fabric into strips measuring about 1 inch" wide and approx 12" long. Be ready to experiment a little here - it depends on how many different types of fabric you want on each ring. Wind a strip around a hoop, leaving a 2" loose end. Take a second fabric strip and tie it to the end of the first strip. Leave the ends to stick out. 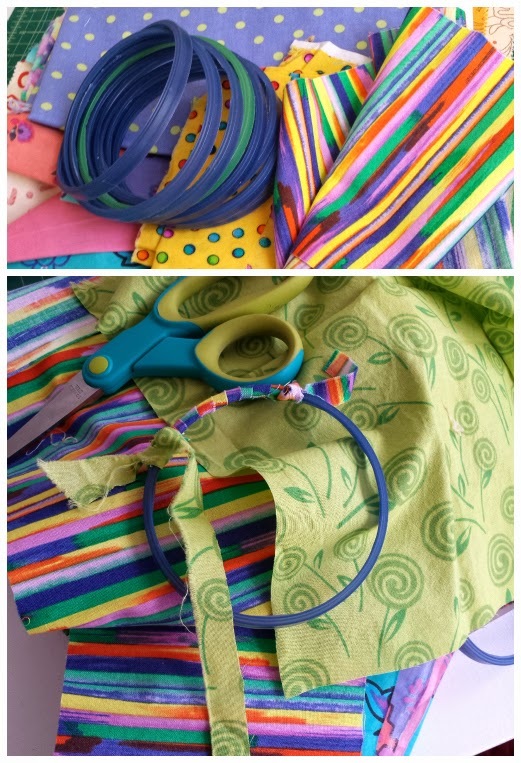 Wind the new strip around the hoop, and continue attaching and winding fabric strips until you cover the whole hoop. Tie the end of the last strip to the beginning of the first strip. Once the hoops are covered, make the swings by joining two hoops together. You can tie them. I used hot glue. Head over to the The Red Thread to find out how to make paper mache birds. You could also search for free printables and reinforce them with mod podge. Or fuse fabric, cut out bird shapes then reinforce those with mod podge. I chose to repurpose wooden birds I once used to build a crib mobile. And that's it really. You can attach the hoops using embroidery thread, yarn, ribbon or scrap fabric. And if you want a more classic hanging mobile, wooden hoops are easy to find at hobby stores.